The Bicycle Bill of Sale is a simple document that will prove the legal purchase and sale of a bicycle between a seller and buyer and proof of the change of ownership. 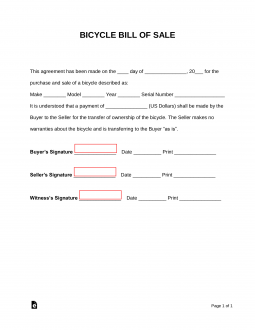 This document will provide information regarding identification of the bicycle, the cost of the sale and signatures acknowledging the sale between the parties. What is a Bicycle Bill of Sale? The Bicycle Bill of Sale form is a document used to record the legal purchase or transaction of a bike from buyer to seller. Think of it like a receipt. It provides proof of ownership by describing the fine details of the bike up for purchase, the cost of the bike (if any) as well as the buyer and seller’s signatures of agreement. Why Do I Need a Bicycle Bill of Sale? A Bicycle Bill of Sale is important for a number of reasons. It provides record and proof of ownership. Helps trace back the history of the bike (in case it was stolen). It offers a sense of security that can protect the buyer or seller in the event the bike was stolen or used in an illegal activity prior to or after the transaction. It is great for quick and easy “As-is” sales. There are tons of bike snatchers looking to sell bikes they take for quick and easy cash. So here’s our advice on the where and how of selling your bike. It’s safer to sell your bike to people you know or to reputable sports equipment shops. If you have to sell to a stranger (either online or through a news ad), then meet and make the exchange in a public place with plenty of people around. Clean your bike and all its parts. Check to make sure all its parts function properly from the brakes, chains, and wheels. Have an idea of what you’re hoping to sell your bike for. Chances are you’re going to have to negotiate the price, so have a high sell mark and a low sell mark. And make sure to be reasonable with the price – otherwise, you may have trouble finding a buyer in a reasonable time frame. Contact friends, place ads, or go to pawn or used equipment shops. Make sure to speak with each potential buyer to find one willing to make the best price. Lastly, meet the seller. 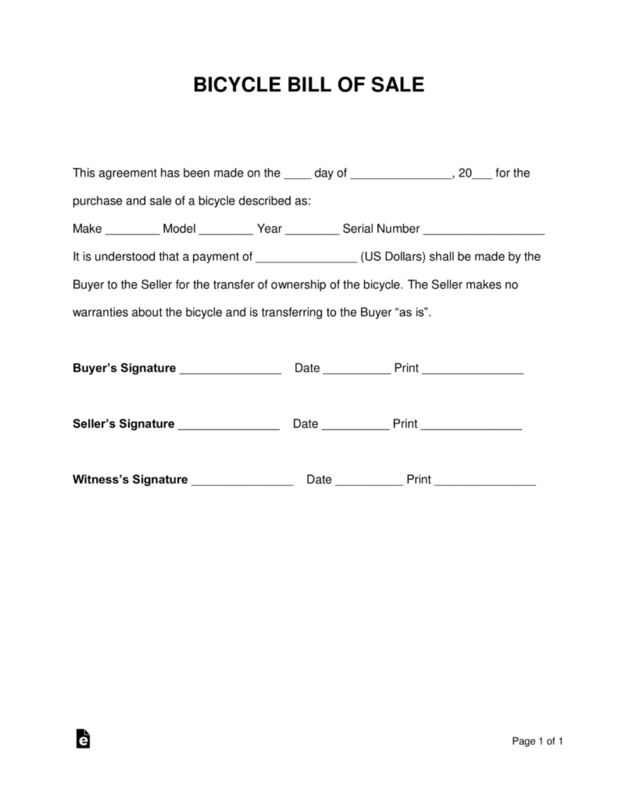 complete the Bicycle Bill of Sale form to finalize the sale, and transfer it to the new owner. You’ll need the Bicycle Bill of Sale form to finalize the sale. Thankfully, it isn’t too difficult to understand. After the Bicycle Bill of Sale form is complete, copies are given to both buyer and seller, and sale price is met, then the sale of the bike is complete.